Our unique hotel features the 489 of the largest guest rooms in the Anaheim area. You will feel at home on 13 acres of strolling gardens - fountain and scenic Koi pond for the perfect accent to your Disneyland vacation. We feature a full service restaurant - deli - gift shop and game arcade. Stop by the Disney Desk in our lobby where you can purchase multiple - day Disneyland Resort Park Hopper Tickets then take our free shuttle to Disneyland. The Majestic Garden Hotel can accommodate up to 1000 guests in our banquet facilities - Whether you are planning your dream wedding or organizing a conference we will help you plan an event to remember in a magical setting like no other. After a busy day lounge beside our sun drenched pool and spa or explore the nightlife of Downtown Disney featuring great restaurants and entertainment venues like the House of Blues - the ESPN Zone Sports Arena or Rainforest Cafe to name a few . Casual Dining for breakfast lunch and dinner. Omelettes sandwiches soup and entrees. 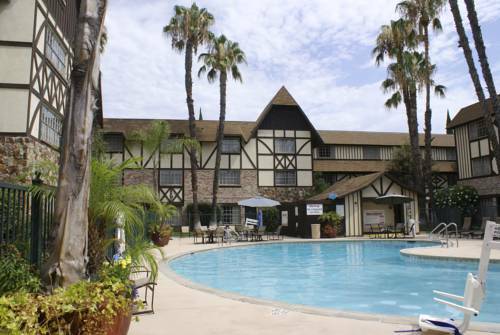 Located less than one mile from hotel and is accessible by taking hotel shuttle to Disneyland.